Looks like there's a new catalog. GS series has the smoking quillable whistle! Update:5/1/18 --- Two GS4 paint schemes have been **CANCELED** due to not enough pre-orders. I would recommend strongly that people get pre-orders placed early and don't wait till the last minute. You can expect there will be some additional number of engines produced over the official pre-order counts but as we saw with the 4012 Big Boy those have already sold out in the pre-order stages. A few missed out on the Santa Fe F7s released not long ago because so many knew of the engine but didn't place orders till MTH had them in-stock. So if you want the engine get the pre-order placed. My guess is expect delivery to be Jan 2019 time frame. I think I may have to get a few more CSX -8s. I may as well modify the oldest abused ones I have. when they start taking pre-orders. I'll have to get back on the rest. I really hoped for a new diesel, maybe even with charging lights. Does anyone know if the 2017 model will feature a close coupling between engine and tender? If you look at the small pics it looks like the tender is hauled on a string. The pics must be a smaller scale. Then look at the small pic of the Big Boy. The tender is very close to the engine as it should be. It will have a Wireless drawbar (like the new One Gauge Big Boy that is coming) which will likely fix the distance of the coupling between engine and tender. Do not know how close it will be on either engine. Wow, that's very exciting! I've been waiting and hoping for MTH to re-release the GS-4 with PS3. I'm been mostly looking (well, saving) for an Accucraft GS-4 to best match my new Accucraft Daylight cars, but for the price, with built-in DCC, I will have to strongly consider MTH! Any guesses as to the timeline? And will pre-orders be required? I always have to laugh when there some simple mistakes in the catalogs. They took a picture of the SFe Dash8 and the front bottom step is missing. They state that all 1 gauge engines and cars have KD pads. I can't think of any of my MTH diesels that have these pads. Maybe something new coming? "All RailKing One-Gauge engines and cars are supplied with truck-mounted operating knuckle couplers, hook & loop couplers, and body mounting pads for Kadee® couplers — so they can mate with virtually any other garden-sized train system." I have not seen the BNSF version of the 4449 in real life photos. Does anybody know the history of the engine with them? Did they have it for some time maybe on an excursion? I'm tempted to order the version in black. I Like the skirting of the SP Daylight version. Sounds stupid just to pick on that alone? Regarding Ben's questions, I moved my reply up to post #2 which is where I will provide updates as I get them. 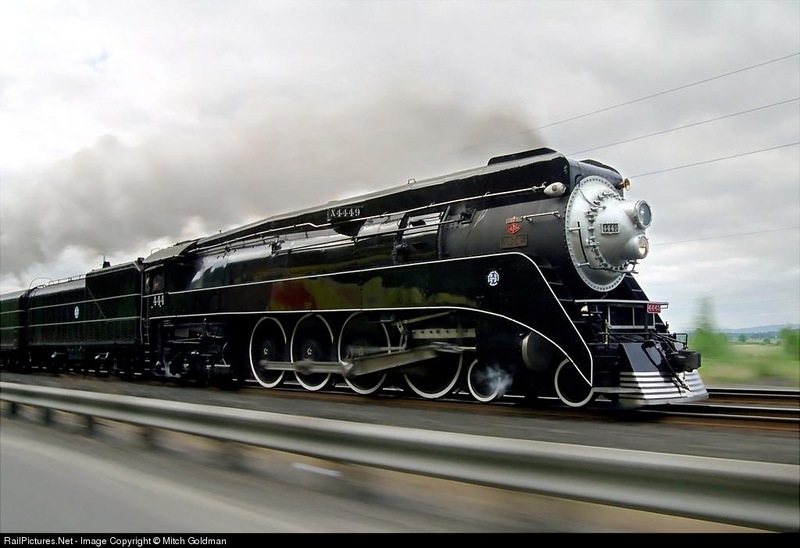 The SP 4449 was painted in all black with BNSF logos for a couple of years. 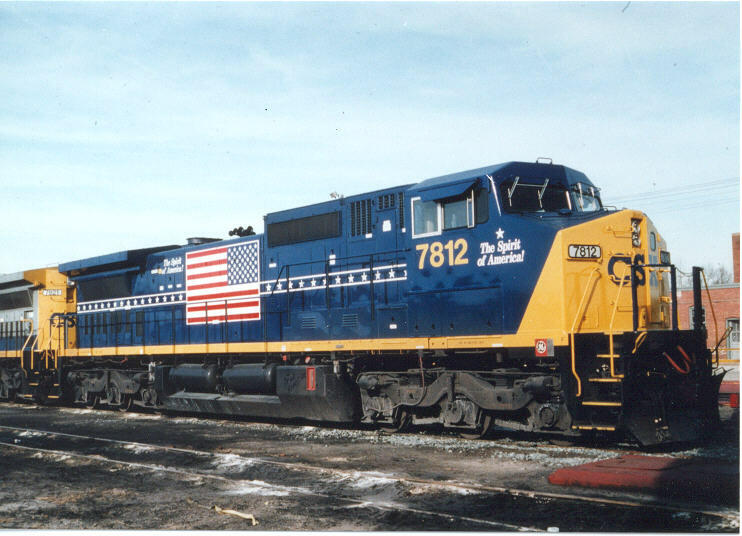 I understand that BNSF requested the engine be painted with BNSF logo for the excursion runs. I may like it as much painted gloss black as any other scheme! Is she pulling a extra tender? It does look good in all black. There was a bit of an uproar by steam fans over painting over the Daylight colors (not unlike what you see on model train forums). She was pulling an extra water tender. Yes I think it's just the photo from the prior release since they have that engines listed as a GS-4 (but shows a GS-2/GS-6) nose. My guess they will in fact ship without skirts but with GS4 nose. I'll email them about it to confirm about the nose to make sure they are aware. It was actually another one of my suggestions was to consider offering a full side skirted GS4 / 2 in all black war baby paint. So the only thing not correct is the GS-2 nose shown in the photo. Here is my GS-2 with black side skirts (Thank you to Chuck for the great custom paint ) I still have yet to paint the smokebox black. Pretty exciting to see the new catalog. The new features on the BB sound great. No cable to hook between and the stronger frames. Now if they would just get them over here! I posted links to it on Large Scale Central and My Large Scale. Do you know when you will be able to start taking pre-orders on the new Daylight? Probably only a few days. I had to go back and look again at the BB I ordered from the last catalog. It does state a wireless drawbar. moved to a Mar. 17 date now. And I thought MTH's G is under the earth, six feet deeper. Nice that it goes on, unfortunately nothing new. Which Dash 8 looks best .... Are all real ... ??? What is meant by First Responders or Veterans ? 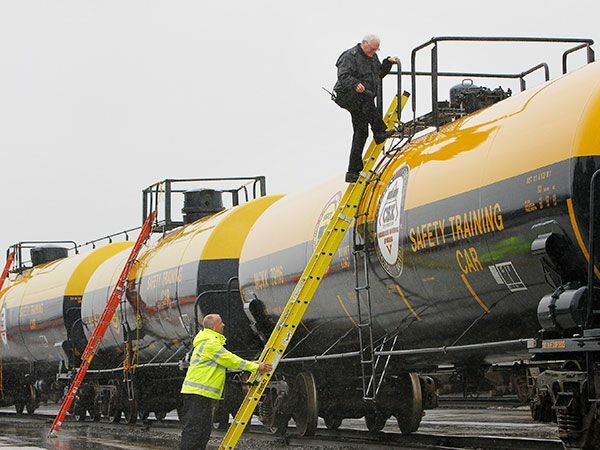 And what is a Saftey training car, CSX Tank Car ?
" And I thought MTH's G is under the earth, six feet deeper. " Do what? Not sure where that came from. I believe that the CN version maybe the most scarce of those sold years ago. I like the new CSX boxcar logo. 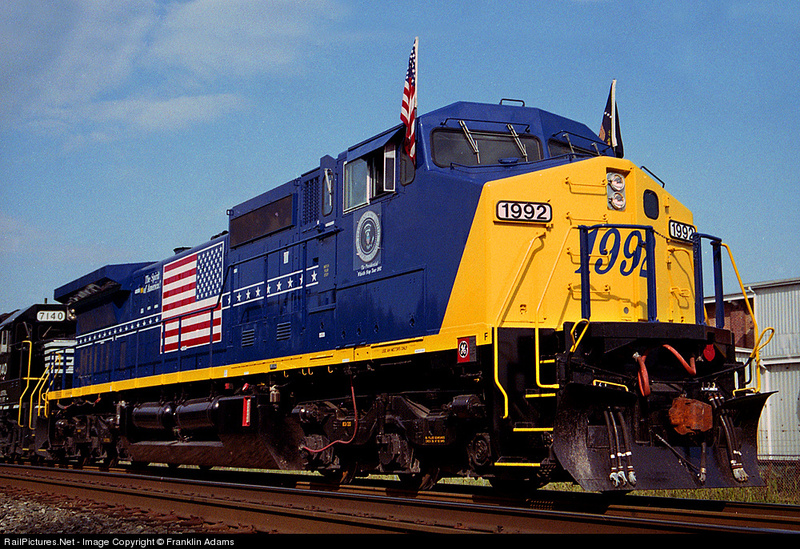 I have the CSX presidential version in O scale #1992 so I would probably grab the other number to tell them easily apart. The CSX safety train is a real train used to help train first responders. 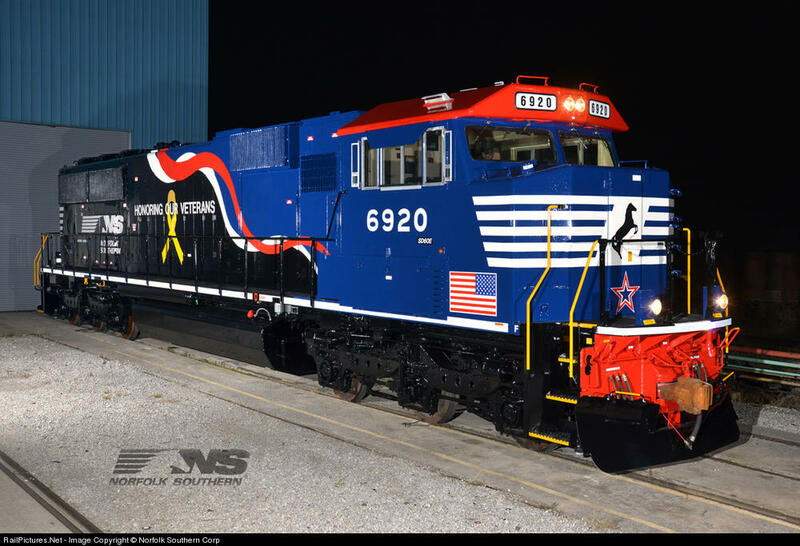 The two NS versions are paint schemes applied to modern engines by Norfolk Southern to honor the Veterans and the First Responders. They sold very well in O scale. I bet MTH thinks they would sell well also in G.
If they had put it on a new modern diesel release, I would have ordered them all. So I'm slightly disappointed that there was no modern diesel as talked over awhile back. No new ES44 with charging lights. No small steamer either. I won't bash them as I understand there here in G to make money. I hope they do. I'm glad they offer their better made (metal gears), value packed engines in G. I'm still just hoping for more choices in modern. 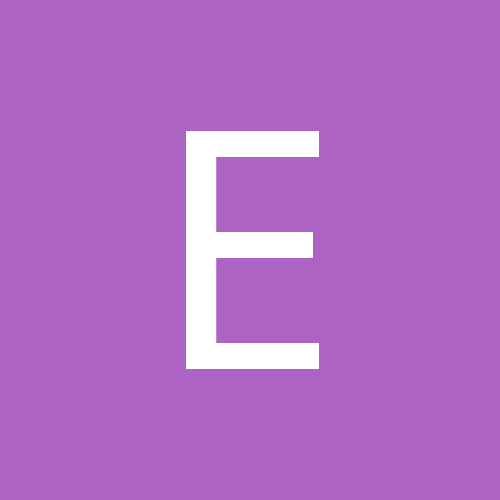 Some premier level engines and/or cars would be great too. I bought the Accucraft pass cars. I would have bought them from MTH. Maybe I should have released my EMD SD70ACe in G scale after all. I wanted MTH guts inside. I'll just have to make more of my own. Now why would MTH slap a modern paint scheme on an old box car with illegal trucks for modern use? I can't seem to copy the image from the new catalog? At least they should put their version of roller bearing trucks on it? Maybe not? I have not been able to ever figure out, why certain cars come with roller bearing trucks. The tank cars I have, some are and some are not equipped. It could match the year of the paint scheme but it doesn't. Same with the coal cars. I read a lot of posts in O scale forums complaining about these very things. I always feel that some are just grumbling on. I am realizing that if we don't complain, they won't care. There was a catalog from MTH this past year of the new Genesis that had the wrong road number for the model. Guys complained enough, and MTH promised to fix it. They still had not fixed it for preorder deadline, so I did not order it along with other guys. I don't wish to get too nit picking, but I am not a totally blind follower. So come on MTH, please take care of us. I am still and always will be waiting for that new modern diesel that was talked about! I would love to see modern metal roller bearing trucks with real bearings inside. Yes, I will pay more for them. I might have to go for that Veteran's one. Fit in well with my Army Train I made.